This 30-day extravaganza of Rally for Rivers cannot be forgotten by the Isha volunteers - those who were travelling with the rally and also those who were not. The trials and tribulations of travelling on Indian roads day and night for a month, the joy and discomfort of eating different cuisines each day, seeing people of different cultures, sleeping on different beds for less than a few hours, or not sleeping at all; this 30-day extravaganza of Rally for Rivers cannot be forgotten by the Isha volunteers - those who were travelling with the rally and also those who were not. Sadhguru arrived at India Gate a few minutes past midnight, where hundreds of people were waiting to receive him, to welcome him for culmination of this historic rally. In the evening of Mahatma Gandhi Jayanti, the culmination event of Rally of Rivers displayed the zest, profoundness and glory of all the previous mega events in 16 states. Thousands of people were tapping, jumping, hoping and dancing to the tunes of Sonu Nigam who set the fervor of national pride by singing contemporary versions of popular patriotic Bollywood songs. The nostalgia of “Jahan Dal Dal Per Sone ki Chidya” - on each branch of the tree there is a bird of gold, that is my Bharata; the pride of “Main Os Desh ka Vasi Hoon” - I am resident of that country where Ganga flows; the fervor of “Mera Range de Bansanti Chola” - paint me yellow as I am ready to be sacrificed for a great cause, were overwhelming for all those who grew up with these numbers. The Rally for Rivers indeed has been a movement not just to bring people together to save the rivers, but also to strengthen their emotions for the nation - to make them emotionally connect to the soil, water, farmers and soldiers of this country. Dr. Harsh Vardhan, Minister of Science and Technology, Environment, Forest and Climate Change, said, “I have attended many functions in this stadium before but I have not seen such an ecstatic crowd so full of energy. 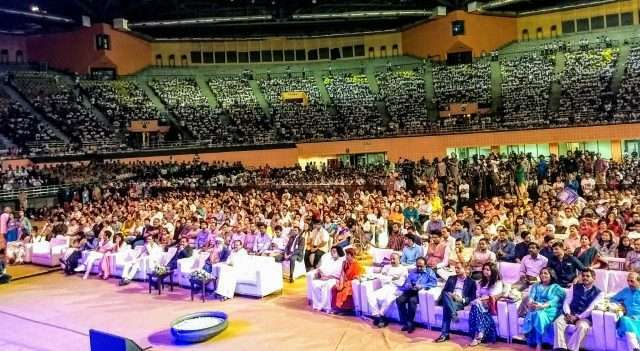 I wish this display of energy is not only to welcome Sadhguru, but also for Rally of Rivers.” He added later, “I am also desperate to understand and implement Sadhguru’s recommendation that he has charted out.” Dr. Vardhan also conveyed Narendar Modi’s greetings to Sadhguru and to all the volunteers of Rally For Rivers. Below is a short story that Sadhguru shared to show the value of strengthening the emotions of human beings to take them forward. A journalist questioned Sadhguru on the necessity nationalistic displays of emotion, such as shouting “Bharat Mata ki Jai”, standing up for the national anthem, etc. To this Sadhguru asked him if he had a family. “Yes,” the journalist responded. “Can you build a family without investing your emotion in it. Will anybody stay with you?” Sadhguru asked him further. “No,” he replied. “Then how do you build a nation without emotion?” Sadhguru asked pithily. “Why should these soldiers (pointing to the BSF soldiers who were present among audience in large numbers) go and stand at the border, and maybe get killed one day if this nation doesn’t mean anything to you and me?” Sadhguru emphasized further. “Don’t miss to give the missed call,” said Venkaiah Naidu, inspiring the youth to participate in this mammoth movement. He also wondered why people are opposing the support of the industry extended to the rally. “Even the freedom movement was sponsored by the industry then - I don’t understand what is wrong with it,” he said quizzically. Sadhguru closed the event with the recitation of the soulful Nadi Stuti, having all the audience to sing after him one last time. The 700-pages policy document, developed along with the experts of Tamil Nadu Agriculture University, will be delivered to the Prime Minister today, and then to the states and media houses. “The real work begins now!” Sadhguru reminded everyone as the 30 days and over 9000 km of Rally For Rivers came to a close. A man with a heart of gold, on a bike of steel, traverses India from top-to-tip in just 11 days. Bravo!